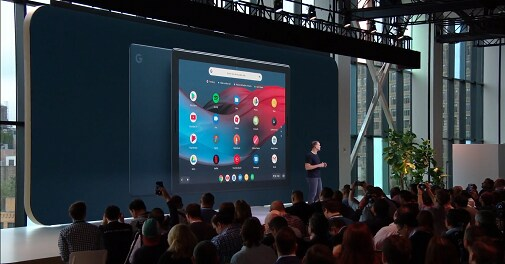 Alphabet Inc's Google launched the Google Pixel 3 and Pixel 3 XL at its annual hardware event 'Made by Google', along with a Google Home Hub, a new Pixel Slate tablet and and Pixel Stand wireless dock. The Pixel 3 and Pixel 3 XL are available for pre-order at $799 as of now. It will be available in three colour options - Just Black, Clearly White and Not Pink. It will be available in India from November 12. 08:32pm: Google cues the short video earlier posted on the Made by Google Twitter handle mocking leaks about the Pixel smartphones. Has Google pulled the biggest bamboozle in the world of technology!? Stay tuned to find out. 08:37pm: "The incredible technologies you'll hear about today are built on this twenty-year history of making information more helpful and accessible for people," says Rick Osterloh, SVP Hardware at Google, as he opens the Made by Google event. 08:42pm: Developed new tools to let you control your devices, instead of those devices controlling you, Osterloh said. 08:44pm: For life on the go, we designed the world's best camera, and put it in the world's most helpful phone, Osterloh said whle introducing the Pixel 3. "For life at work and play, we are bringing the power and productivity of a desktop to a gorgeous tablet called Pixel Slate. And for life at home, we designed a smart display so you can hear and see the info you need and manage your connected home from a single screen. Introducing Google Home Hub," he further said. 08:46pm: With Google Home Hub, we have redesigned Google's most helpful services like Search, YouTube, Maps, Calender and Photos so they are easily controllable by your voice and provide glancable help, says Diya Jolly, Vice President, Product Management at Google. 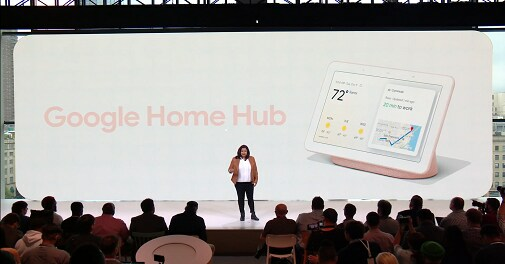 08:50pm: The Google Home Hub comes with a display designed specifically to help you in your home environment, Jolly said. The design incorporates rounded corners, premium matrials and custom fabric, she added. The Google Home Hub will be available in four colours with a floating display. 08:51pm: Consciously skipped the camera on Google Home Hub so that it is comfortable to use even in private spaces, like your bedroom, Jolly said. 08:51pm: With Ambient EQ, the screen on Google Home Hub can adjust to the ambient lighting. Can even turn off at night, adjust to lighting conditions at different times of the day and also you home decor. It ccan even provide personalised responses by identifying which family member is talking to it. 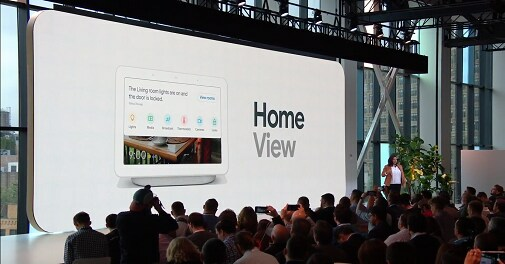 09:01pm: With Google Home Hub comes Home View which comes with a dashboard which shows the condition of your entire home, and provides you access to all your devices. It can be accessed by a simple tap or even your voice You can even see things by room. It even comes integrated with smart appliances across all your home. 09:02pm: Live Albums and digital photo playback allows you to see and share photographs on Google Home Hub when it is not in use. Blurry or badly captured images are left out. 09:05pm: The Google Home Hub is available for pre-order on Google Store from today for $149. It will available for purchase in US, UK and Australia on October 22. 09:09pm: We combined the helpful elements of laptops, tablets and smartphones to create a modern computing experience people have been asking for, said Trond Wuellner, Director of Project Management, Google said while introducing the Pixel Slate. 09:10pm: The Pixel Slate boasts of a display which has a pixel density of 293ppi, with a custom display which lights up pixels a lot faster, Wuellner said. With dual front-facing speakers and tuned audio algorithm allows for crisp highs and clear lows. This combination gives the best entertainment experience you can hold in your hands. 09:13pm: 8MP front and rear cameras, which incorporate machine learning for better images and portrait photos. The front facing camera is a wide-angle lens for covering wider frames video chat, and excellent low-light performance. 09:15pm: ChromeOS has been redesigned to be used with a touchscreen while providing a full desktop experience, Wuellner said. Google Assistant has been more deeply integrated in the ChromeOS with Pixel Slate. With Google's focus on digtal well-being comes Family Link which allows to set diital ground rules for the Pixel Slate. 09:16pm: Virus security is built in, and updates happen at the background as to not disturb the ongoing tasks. The power button also doubles as a fingerprint reader. 09:19pm: The Pixel Slate comes with a PixelSlate Keyboard, a full-sized, backlit keyboard with rounded keys and a fully functional trackpad in a folio design. 09:20pm: Apps have been optimised for working with the redesigned ChromeOS while keeping the desktop experience intact. 09:22pm: The Pixel Slate will be available at a starting price of $599. The Pixel Slate Keyboard will be retailed at $199, whereas the Pixelbook Pen will sold at $99. All of these will be available later this year on the Google Store and with major retailers in US, Canda and UK. 09:25pm: Finally, it's time to talk about phones, says Google's Product Manager Liza Ma as she takes to the stage with Brian Rakowski, VP, Product Management. The new Pixel phones are finally here. 09:27pm: The two-tone colour scheme is back. With a new etching technique the same piece of glass on the back now has smooth and matte finishes at two ends. 09:28pm: The Pixel 3 comes in three colours - Just Black, Clearly White and a new one, Not Pink. 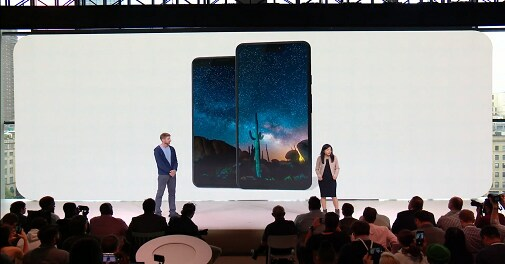 It will be available in two screen sizes - the smaller 5.5 inch Pixel 3 and the larger 6.3 inch Pixel 3 XL. And there is the tall notch we have seen so far. Both phones have taller screens than their predecessors in the same footprint. 09:29pm: The dual front-facing speakers on the Pixel 3 and Pixel 3 XL are 40 per cent louder than their predecessors. 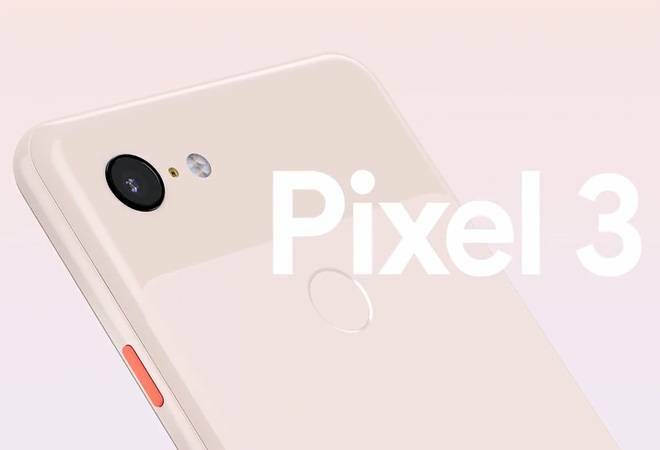 09:30pm: The much-revered camera from Pixel 2 has been made even better with Pixel 3 XL, Ma said. Google has partnered with renowned photographer Annie Leibowitz who will be using the Pixel 3 for her latest project, along with seven other photographers who used it to shoot cover photos for seven magazines. 09:23pm: The camera on Pixel 3 is a true end-to-end combination of our AI, software and hardware, said Rakowski. Pixel Visual Core has been built into the Pixel 3 to transfer the image computational capabilities from Google's servers to your device, he added. The Pixel 3 also comes with Top Shot which uses machine learning to take mulitiple shots to take the best shot. Super Res Zoom on Pixel 3 takes bursts of photos, which then takes the variations to an algorithm for a clear zoomed in photo. Night Sight uses Machine Learning allows for better low light performance without the use of flash. The Pixel 3 comes with a second front facing camera that captures "184 per cent more of the scene than iPhone Xs". 09:36pm: Google Lens has been incrorporated in the Pixel 3 camera. Photo Booth, Motion Auto Focus, and an enhanced Portrait mode are some of the new features with the Pixel 3 camera. 09:40pm: Pixel 3 will be first to get the Google Assistant with DuPLEX technology. 09:42pm: Powered by Google's AI, an improved Call Screen can answer a call in real time. It will be made available with Pixel 3 in US and will come to rest of Pixel devices next month. 09:44pm: Here comes the new Pixel Stand. Coupled with Google Assistant, the Pixel Stand changes the way the Pixel 3 will interact with the user. 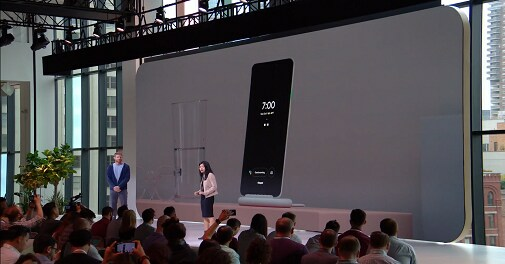 09:50pm: The Pixel 3 is available for pre-order at $799, whereas the Pixel Stand can be registered for $79. The Pixel 3 will arrive in US on October 18 via Verizon. On November 12 it will made available in twelve markets, including India.